NEW DELHI: One reason for the NDA government’s June 2015 decision to scrap a request for proposal (RFP) for a 126 fighter aircraft deal arrived at under the previous administration was because Dassault Aviation, the L1 or lowest bidder, would have lost that position after taking into account its commercial offer to state-run Hindustan Aeronautics Ltd (HAL), where some of the aircraft were to be locally manufactured. Moreover, the Eurofighter, produced by EADS, would have come into contention. In the event the decision was taken to opt for a government-to-government deal to buy 36 Rafale fighters in flyaway condition from Dassault without any manufacturing in India. ET has reviewed the relevant documents explaining the rationale for the withdrawal of the UPA-era request for proposal, floated in 2007, and the subsequent decision to buy 36 Rafale aircraft. “By applying a factor of 2.7 on the man hours quoted by Dassault Aviation and EADS, the ratio of Net Present Value (NPV) based total cost of acquisition as on November 2011 would have undergone a material change to the extent that Dassault Aviation would have no longer remained L1 vendor and would have become L2 vendor,” states the assessment documents on withdrawal of the UPA version of the Rafale deal. 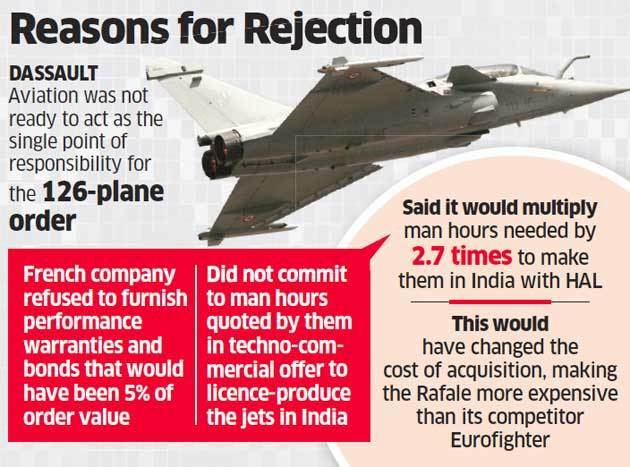 Among the seven reasons cited in internal records for cancelling the UPA’s Rafale deal, one key point was that the Eurofighter would have been more economical to buy and produce in India after calculations done by state-owned Hindustan Aeronautics Limited (HAL) were taken into account. The NDA government signed up to buy 36 Rafale jets in September 2016 for €7.8 billion and has been under fire from the Opposition on charges that it paid much more for the fighters compared to the deal that was being negotiated by the United Progressive Alliance (UPA). In its defence, the government has repeatedly said that if UPA terms had been followed, the Rafale deal would have cost significantly more, at €8.2 billion. However it appears that the Eurofighter wasn’t considered though it had, as per the government’s analysis, become cheaper than Rafale as per the terms of the previous deal. Also, Germany in July 2014 made an offer to the NDA government to further bring down the price of the jets by 20%, but India never responded. The seven reasons cited for withdrawing the UPA version of the deal include Dassault’s failure to furnish performance and warranty bonds and refusal to act as single point of responsibility for the contract. One concern was that in negotiations with HAL, which has been mandated as the production agency, the French company had asked for a multiplication factor of 2.7 in terms of man-hours needed to produce the jets. Both the French Rafale and Eurofighter Typhoon had been found compliant with regard to all India-specific requirements by the Indian Air Force in 2012. However, Rafale was then declared as the lowest bidder. While a detailed query by ET to the defence ministry was not answered, defence minister Nirmala Sitharaman confirmed to Parliament in March this year that EADS, which makes the Eurofighter, had submitted revised offers in 2011 and 2014. “The unsolicited offers of M/s EADS were received prior to withdrawal of RFP on 24th June, 2015,” the minister said. The German offer, which was made at the top level of the Indian government, had also promised to divert deliveries of Eurofighter Typhoon jets from Britain, Italy and Germany to meet Indian needs on an urgent basis. While the German offer was heard out, no further negotiations were carried out after it became clear that only Rafale was being considered.